There are almost as many kinds of sausage as there are countries, and Sicily was once a country. The typical Sicilian sausage is salsiccia alla pizzaiola. This is made with ground pork and spices but also chopped onions, tomatoes, parsley and sometimes chunks of cheese or even pine nuts. The word itself comes to us from the Latin salsus, meaning "salted." By definition, sausage is ground meat packed into a casing - usually beef intestine. Stricyly speaking, salame is a sausage but not all sausage is salame (which is cured and dried). Some sausages are made of cooked meat. This includes most German wursts, Polish kielbasa and Italy's mortadella, sometimes called "bologna" for the city where it is made. Pizziaola is fresh ("raw") sausage and it includes no organ meats (offal). This brings us to an interesting point about sausage. In central and eastern Europe - and apparently in Bologna as well - sausage resulted from the efforts of butchers to sell scraps, fat and offal in a "presentable" form which also lent itself to storage. Sausages and salami could be said to be some of the earliest "processed" foods. There is a literary reference to sausage made of lamb and goat meat in China before 500 BC (BCE). Its existence in ancient Sicily is connected to the Greeks. Blood sausage is mentioned in Homer's epic Odyssey. Epicharmus and Aristophanes both mention the food in their plays. In Roman Italy Lucania (now Basilicata) was known for its sausage, Lucanica. We do not know which kind of sausage meat the ancient Sicilians preferred. Beef was rare, and by the ninth century a significant segment of the population (Muslims and Jews) would not eat pork. Sicilian sausage is not cured or fermented, and its shelf life is limited. The vast variety of Italian sausages is surpassed only by Germany's. These include everything from raw sausage (like pizzaiola) to cooked sausage (wurstel and mortadella), liver sausage, blood sausage, cheese sausage, the numerous salami and - more recently - sausage made from fish, seafood or poultry. 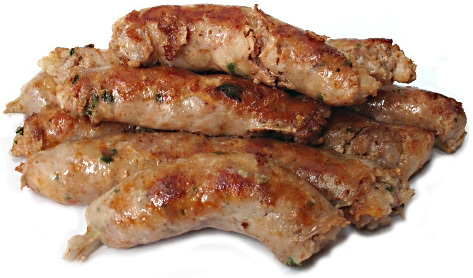 For a "raw" sausage, pizzaiola has a distinctive flavor. It's great grilled over an open fire, or even in pasta sauces. Ketchup, mustard and yogurt sauce are suitable condiments. By tradition pizzaiola is eaten in sandwiches alone, with no need of enhancements, but you might try it with a real Sicilian frittata.